Since the disastrous end of the Broncos’ 2017 season, there have been rumblings that there might be a roster shake-up the roster after a historically poor 5-11 performance. One of the most oft-mentioned moves the Broncos could make is parting ways with one of (or both) of their Pro Bowl receivers to clear up cap space in order to pursue expensive free agents, such as Washington quarterback Kirk Cousins, a name popularly associated with the Broncos. Everyone is familiar with both receivers’ credentials as Pro Bowlers in the NFL. Thomas boasts five Pro Bowl appearances in his Broncos’ career and recently climbed into second place on the Broncos’ all-time list in receiving yards in 2017. Sanders has also been a key to the Broncos’ success, making the Pro Bowl in two of the four years he has been a member of the organization. The elephant in the room is the salaries both receivers are commanding in the upcoming season. 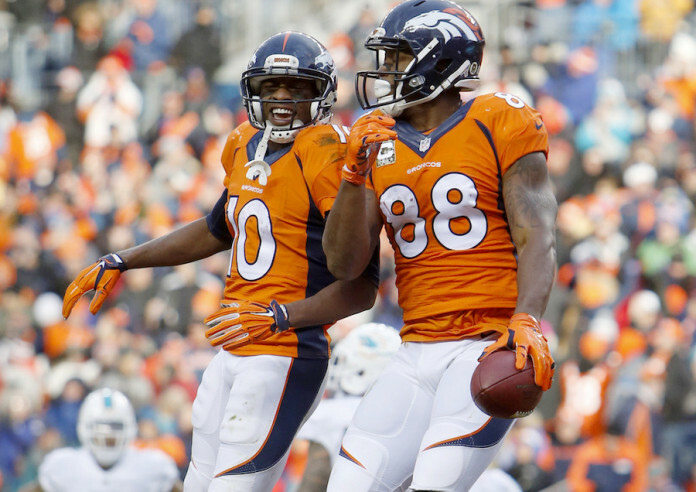 Thomas is slated to have a cap hit of $12.03 million, while Sanders will cost the Broncos a cap hit of $10.94 million. Those numbers are second and fourth most on the team, respectively. Given that both receivers struggled statistically last season, it’s no surprise that both receivers have been in the spotlight of rumors as potential “cap casualties.” Combined with Thomas’ $4 million option that would void his contract and make Thomas a free agent at no additional cost to the Broncos, the temptation is certainly there to part ways with either receiver and use that extra cap space to court Cousins, or other big-name free agents. No matter how you look at it, parting with either Demaryius Thomas or Emmanuel Sanders would be a grave mistake that the Broncos cannot afford to make in such a crucial offseason. Cutting one (or both) of the receivers would be in complete contradiction to the Broncos’ plan of courting Cousins or grooming their next franchise quarterback. Taking away the two best receivers on the Broncos’ offense would deter Cousins from coming to Denver, or give their rookie quarterback a lesser chance to succeed as he adjusts to the NFL. Thomas and Sanders are both coming off of disappointing seasons, as both struggled with poor quarterback play and various injuries. However, the Broncos will need their veteran leadership and proven production if they want any chance of swaying Cousins to the Mile High City over the Browns or the Jets, who can both offer Cousins much more money than Denver can. Currently, the only other wide receivers under contract behind Thomas and Sanders are Carlos Henderson, Jordan Leslie and a player who likely wouldn’t make any other roster int the NFL. Cody Latimer is set to hit the open market as an unrestricted free agent, while Jordan Taylor and Bennie Fowler are set to become restricted free agents themselves. Even if retained, none of those players has proven to be an effective replacement as a starting wide receiver. Replacing either receiver could be a tall task for the Broncos, as the free-agent market for receivers is saturated with aging veterans such as Mike Wallace, Danny Amendola or former Bronco Eric Decker or unproven “big-names” like Sammy Watkins, Terrelle Pryor, and Allen Robinson. The prize of the free agent pool at receiver is Jarvis Landry, who already has his eyes set on an ‘Antonio Brown-like” sized contract, the Broncos are not in a position to offer that kind of money to Landry, especially if they bring in a veteran quarterback. With the Broncos’ salary cap already stretched, there simply isn’t another option that the Broncos could bring in that would be more of a value than Thomas and Sanders. Aside from the sentimental value the Broncos or their fans may have for the receiver duo, the bottom line is that the Broncos are a better football team with Nos. 88 and 10 on the roster.